Every young writer needs a cheerleader in their corner. So glad they have you to guide them! It is amazing what they can do, isn’t it. I’ve seen my 6th graders grow so much this year. 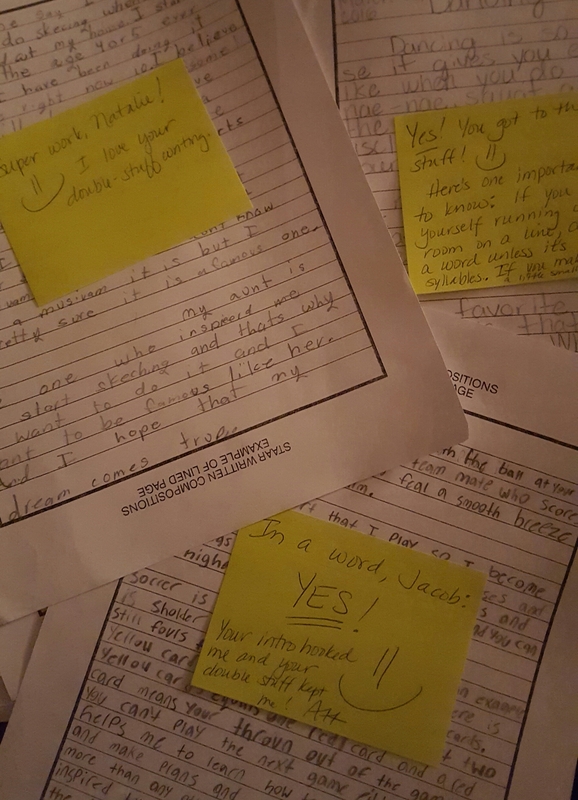 It is work getting through them all, but so meaningful for them to get the feedback. What a wonderful celebration of your students’ accomplishments! It is a great feeling, isn’t it, to see the change in their attitude toward writing. I wanted to rejoice a couple of weeks ago when I overheard a student of mine declare that he loved writing. Oh!!! Then sings my soul! Your comments for them definitely keep their pencils flowing and going, and their brains a-growing! Heart warming stuff!!!! 🙂 One of my kiddos wrote today about looking forward to her sticky note each day. Then sings my soul, indeed!